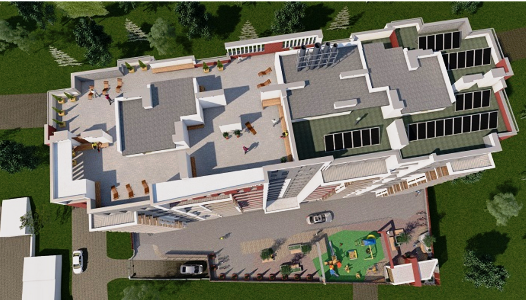 Lviv IT Cluster, one of Ukraine´s leading IT businesses, is currently building up a multi-family house for its employees that meets all the requirements for a smart property, including a modern heating system. It offers 72 flats on ten floors and is being built in Lviv, in western Ukraine. The gas condensing boilers for the heating station on the most upper floor will be delivered by German boiler and collector manufacturer Vaillant Group, which is also said to install the 30 collectors on the building’s roof once construction has been completed. The illustration shows a 3D model of the “IT House”, where construction for the 6th floor is underway, as an online webcam shows. Several online reports describe the project as the Silicon Valley of Ukraine – as comfortable accommodation with a modern IT infrastructure – which will be offered to employees for sale. The initiator is Stepan Veselovsky, co-founder and CEO of Lviv IT Cluster. Construction of the multi-storey building began in October 2015 and should be complete by mid-2017. The collector field is to be installed on the roof and should provide 70 % of the energy required for the residents’ hot water demand. Two separate pipes were planned to supply hot water and cooling to every flat, and each of these flats would be equipped with an electronic controller for floor heating, Veselovsky’s office said. “We plan to install an AuroFlow drainback system in the IT House for hot water preparation,” confirmed Alexander Rohn, Country Director at Vaillant Group Ukraine. “It has the advantage of not overheating in summer, as the solar circuit drains into a special vessel within the drainback module if there is no longer a need for hot water.” Vaillant explained that the drainback systems maximised solar gains because the system could be designed for optimal solar heat supply in April or May without risking stagnation caused by an oversized collector field in July or August. A high-efficiency pump would refill the circuit after draining if there was demand for solar-heated water in the tanks or the building. According to Lviv IT Cluster, the solar thermal system would be added one year after the first residents had moved in. Alexander Rohn emphasised that the cloudy weather in Ukraine in spring and autumn did not really allow for the system to contribute to space heating, which is why it was set up to cover only the hot water demand of flat owners. Vaillant Group Ukraine has already installed a first drainback demonstration project at a REWE supermarket in Ukraine’s capital, Kiev. The system with 25 m² has already been in operation for two years, enough time to showcase the advantages of drainback technology.